I’d love to try it, but I get a failure trying to install on my Windows 7 machine. I can send the ClickOnce log if you like. Kevin, I just tried it again on my Win7 machine and it installed correctly. I’d love to see the clickonce log if you have a chance, go ahead and email it to me at tgreenfield gmail com. Thanks! Tim, I got it to install on a second x64 Win 7 box, so I’ll look at the first box and see what’s different. 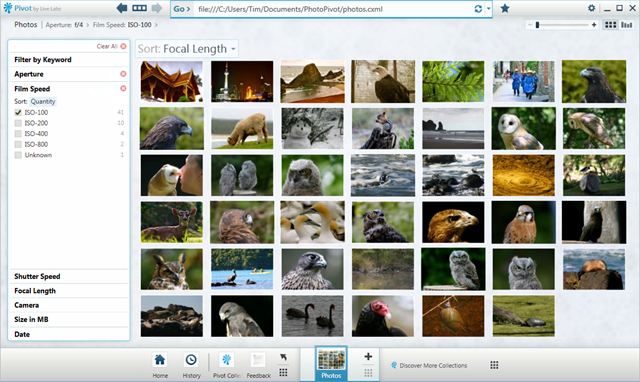 Does your app support tags that have been applied to photos via windows explorer/windows live photo gallery (i.e. star ratings, descriptive tags etc)? New version now includes star ‘rankings’ and description. I also fixed a bug where the date was coming from the filesystem date instead of the metadata (which is much more reliable). Both the binaries and source are updated. The app itself will auto-update if you run it again, close it, and restart it. wow! that’s great, Tim. What other types of metadata will get pulled in besides star ratings? For example if I tag a photo as “pizza” “food” “NYC” will your app create the corresponding filters? Ron or Herman, can you please email me the .cxml file and I’ll take a look (tgreenfield gmail com. I’m guessing that there must be some camera metadata that is causing the pivot viewer to choke. Thanks! I just send you the cxml file. If I replace the values with a , in . then it works! Values in Dutch ar seperated with , iso . Awesome Ron! Thanks for tracking that down. I just updated the app to fix the problem. Note: The app will auto-update if you run it again, close it, and restart it. Additionally, I also added a new category for megapixels and now remove any category where there isn’t a single photo that contains metadata for that category. Yes, it works fine now. Thanks for the update! ThanksTim and Ron, it’s working great now. This is working great for me and I’d like to thank you very much for giving this to us. I would like to extract some other fields from the metadata as well though but I know close to nothing about code. I tried to add to the xmlNode in ImageHelper.cs and as long as it is from the rdf namespace it works. What I want though is the country, city and location fields from the photoshop namespace and there is where I run into problem. I have tried to use the following “/rdf:RDF/rdf:Description/photoshop:country” and numerous variations of the sentence above but nothing ever comes back. Is there any chance you could point me in the right direction? If not, I still want to say thank you for your great little app. great job, i’m interested by your source code of photopivot. I want to adapt it to other type of images. Any idea where microsoft moved the install files and if it still works, or has been broken? I love this. Could you make an easy app like this for Facebook Galleries? and live skydrive with JIT. Also could this code in real time instead of preprocessed? I know there would be a facebook API key field which is great. Thoughts on using this on a server windows 2008 R2. I have 100,000’s of images for a company I’d like to pivot instead of indexing. Could you include a new options to scan subfolders too please. I wouldn’t want to copy all of the folders into one folder if I don’t have too. The other option might be a windows 7 virtual saved search. Sorry also want about an option for themes, company or artist logo. multi-sources. Okay it works, Some jpgs were corrupted so it stopped working, I think.